Floods In South Asia Have Killed More Than 1,000 People This Summer : The Two-Way For the past several weeks, monsoon-triggered floods have devastated regions in Nepal, Bangladesh and India. This week, a new series of storms has brought everyday life in Mumbai to a near halt. 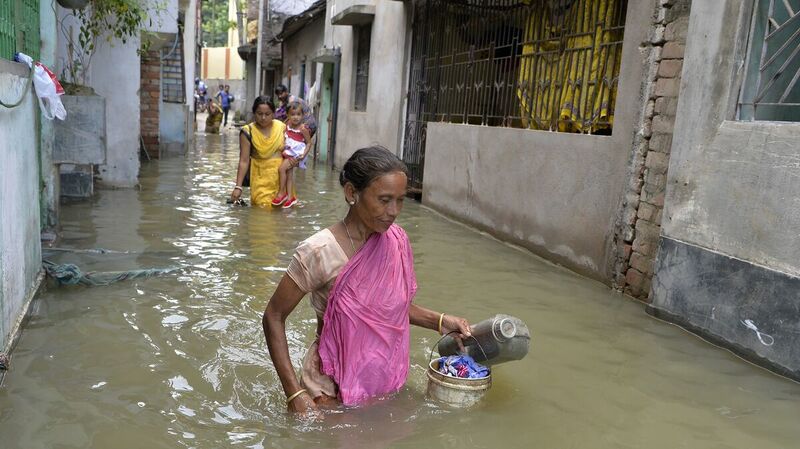 Residents walk through floodwaters in Malda, West Bengal, India, on Thursday. The death toll from floods sweeping South Asia has climbed above 1,000, according to news services tracking official tallies. Weeks of flooding across Nepal, Bangladesh and India have killed more than 1,000 people, according to news agencies keeping track of official death tolls. And while waters are receding in some areas, the monsoon season isn't over. A new round of flooding has brought life to a near standstill in Mumbai, India's financial center and one of the world's most populous cities. Late summer often brings heavy rain, floods and landslides to the region, with deadly consequences. "Seasonal monsoon rains, a lifeline for farmers across South Asia, typically cause loss of life and property every year between July and September, but officials say this year's flooding is the worst in several years," Reuters reports. Millions of people have been displaced or stranded by the storms, which have stretched on for weeks. 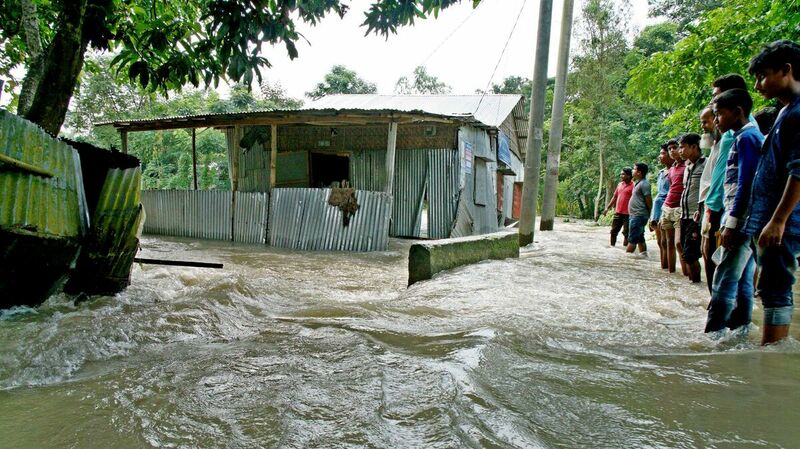 Bystanders look on as floodwaters rage near a house in Kurigram, northern Bangladesh, in mid-August. Tens of millions of people are affected by what aid agencies are calling the region's worst monsoon disaster in recent years. In Bangladesh, the death toll is at least 140, according to the U.N. Office for the Coordination of Humanitarian Affairs. More than 700,000 homes have been destroyed, the office says. So much farmland has been ruined by the monsoon rains that the country faces long-term food insecurity, the U.N.'s World Food Program said last week. The WFP has been feeding more than 200,000 people, according to its statement. "Many flood survivors have lost everything: their homes, their possessions, their crops," representative Christa Räder said. 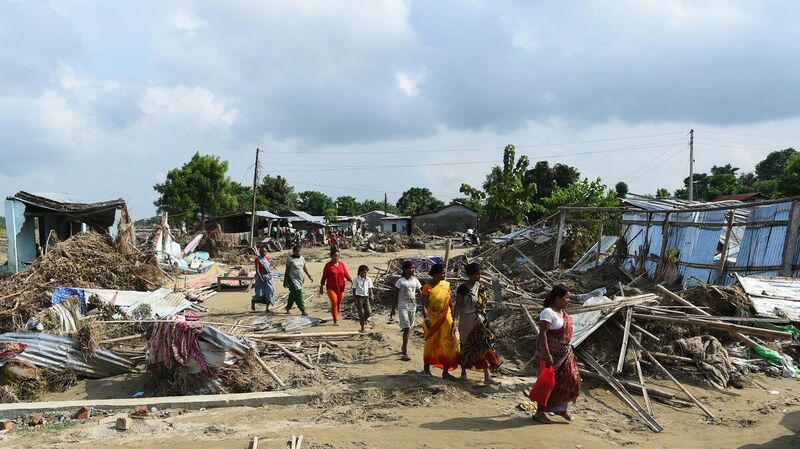 Flood victims walk past damaged houses in Itahari, Sunsari district, Nepal, earlier this month. Severe flooding has left tens of thousands of homes totally underwater in the populous southern lowlands of Nepal. In Nepal, at least 143 people have died, the U.N. resident coordinator says, and more than 460,000 people have been forced to leave their homes. Dozens of people are still reported missing, The Himalayan Times reports. The floodwaters have been receding, the Times reports, but relief efforts are only beginning. And in India, the U.N. says more than 32 million people are affected by the monsoon floods. Last week, the news service Agence France-Presse, tallying official death tolls across five regions, found 726 victims of flooding and landslides, while Reuters looked at six states and found at least 850 people have died. Almost 2,000 relief camps have been established, the U.N. says. Some aid groups active in the region are also responding to the devastating floods in Houston. The challenges are different, Jono Anzalone, the vice president of international services at the American Red Cross, told NPR. "If you compare the shelter conditions in Bangladesh to Texas, as dire as the condition may seem in Texas, typically, we would at least have safe structures on safe ground — not in flood plains," he said. "For better or for worse, when people look at the U.S. response system, we have a very mature federal disaster response system ... You don't see that in Nepal, Bangladesh or India. In Nepal and Bangladesh, the government simply doesn't have the resources." Residents affected by flooding navigate high water to collect relief materials in Udaynarayanpur, West Bengal, in eastern India, on Aug. 1. 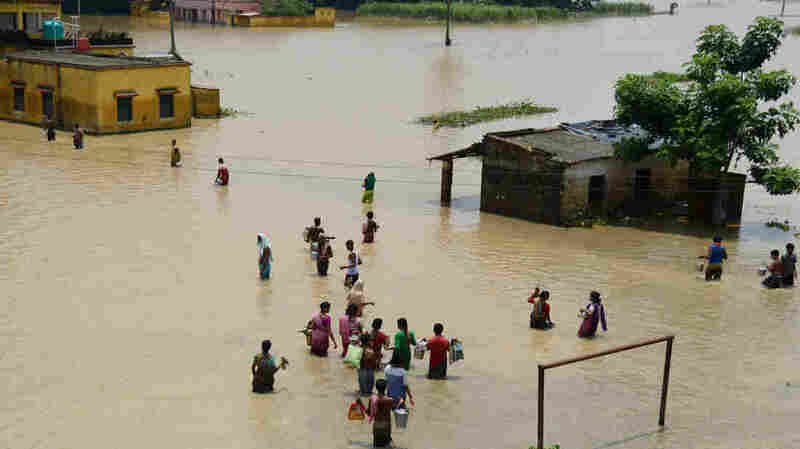 The past few weeks of monsoon flooding have had their most devastating effect on India's east and north. The past few weeks of monsoon flooding have had their most devastating effect on India's east and north, as well as neighboring Bangladesh and Nepal. 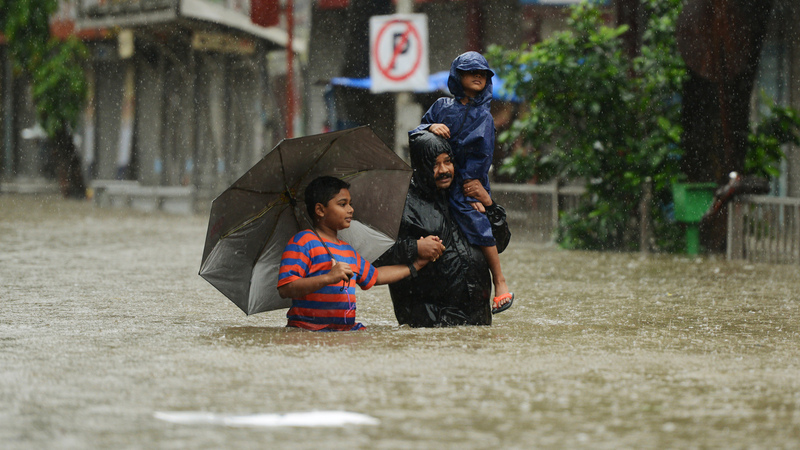 But over the weekend, relentless rain began falling on Mumbai, on India's western coast. The resulting floods brought the city's transportation systems to a standstill. Several trains have derailed after tracks were washed away, the Hindustan Times reports. The Times of India describes roads "under knee- to waist-deep water for several hours," filled with abandoned vehicles. After four days of continuous heavy rain, the city struggled further during high tide on Tuesday, when water couldn't drain into the sea as usual, the Times of India reports. Days of heavy rain have left some streets in Mumbai flooded waist-high on Tuesday. India's financial capital has been brought to a virtual standstill by the widespread floods, and more rain is in the forecast. "Floods in 2005 killed more than 500 people in the city. The majority of deaths occurred in shanty town slums, which are home to more than half of Mumbai's population. "Unabated construction on flood plains and coastal areas, as well as storm-water drains and waterways clogged by plastic garbage, has made the city increasingly vulnerable to storms." There is flooding in a major public hospital, the Times of India reports. Officials have asked that cars outside the city to turn back instead of driving toward the center because waterlogged roads back up traffic and create perilous conditions. At least five people have died in Mumbai's floods, according to NDTV.